I had not heard of Beatrix Brice (also known as Brice-Miller) prior to receiving this book. It turns out she served as a ‘Lady Helper’ during the war and was even Mentioned in Despatches in 1917. The war apparently had a great impact on her and she spent much of her later life dedicated to the welfare of the ‘Old Contemptibles’, becoming a devoted member of the Ypres League. Brice also authored several poems and works about the war, including the 19125 publication, ‘The Immortal Salient’, one of the first guides designed for tourists to the battlefields. The ‘Battle Book of Ypres’ was first published in 1927 – the year the Menin Gate was unveiled – and was a seminal work for its time, setting out the actions that occurred in the salient, listed by location. The influence of regimental histories is evident, for example the entry for Gheluvelt for 31st October 1914 closely mirrors that of the account of the 1st Queen’s contained in the regimental history. In fact the book was largely researched in the early days of the library at the Imperial War Museum; a timely reminder of the inherent value of the collection given the recent threats to its future. 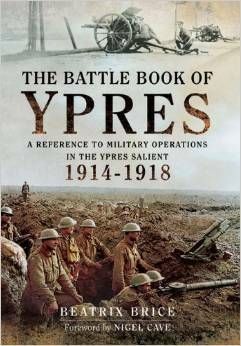 The book opens with brief summaries of First, Second, and Third Ypres, the Lys 1918, and the final advances in Flanders in the closing stages of the war. The remainder of the book provides an alphabetical listing of places in and around the salient, ranging from the large and obvious (Ypres, Passchendaele), through to smaller locations such as ‘Minty’s Farm’ and ‘Skip Point’. The content of each entry is largely made up of narrative accounts of the action interspersed with details of individual acts of gallantry. For the sake of context the entries for the ‘smaller’ places refer the reader to the larger geographic area where it is located, for example ‘Black Watch Corner’ is grouped under ‘Menin Road.’ Entries range from a few lines to several pages, and whilst this layout does not really lend itself to a consistent narrative, where applicable each entry is then further broken down by year. The reader can therefore gain a general picture of what occurred in each location throughout the course of the war. An overall map of the salient is provided for context, but the text would have benefited from smaller maps to further illustrate the battles and actions being described in each location. Whilst the book does not benefit from the research, first-hand accounts, and other information that is now readily available, nevertheless it is still a useful reference work to supplement these other sources.